I'm always fascinated by the paths which lead musicians to my neighborhood jazz club. 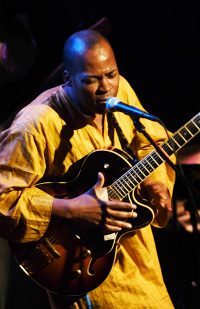 Born in Benin, West Africa, Gilles Lionel Loueke moved to Côte d'Ivoire to attend the National Institute of Art and study music for four years. He aspired to play the music of American jazz guitarists like Pass, Montgomery and Benson, so he applied and was accepted to the American School of Modern Music in Paris - four more years of study. Then came a scholarship to Boston's Berklee College of Music for a degree in Jazz Performance. Next he was awarded a full scholarship to USC's Thelonious Monk Institute of Jazz Performance where he started to play and record with musicians like Terence Blanchard (seen here in 2005 at Jazz Alley) and Herbie Hancock. Now NY, NY is his base and he has signed with Blue Note Records, after releasing a few albums on small indie labels. This (17 years of formal training, touring, and recording), apparently, is what it takes to be nominated by the Jazz Journalist Association as "Up & Coming Musician of the Year"*. It's also what it takes to begin playing clubs like Jazz Alley as a leader, which brings us to his short stay (two nights) here in Seattle before his band heads to L.A. and he joins Herbie Hancock for an east coast tour. His current working band of fellow Berklee and Monk alumni is the namesake trio from his Obliqsound release GILFEMA, Gilles Lionel Loueke, Hungarian percussionist Ferenc Nemeth, and Sweden-born Italian bassist Massimo Biolcati, recently in town with Ravi Coltrane's quartet. In the words of Phil DiPietro at All About Jazz, you can expect, "World music, maybe — world-class, definitely!" * Anat Cohen, born in Tel Aviv, and another world traveler who passed through Berklee, was the winner.